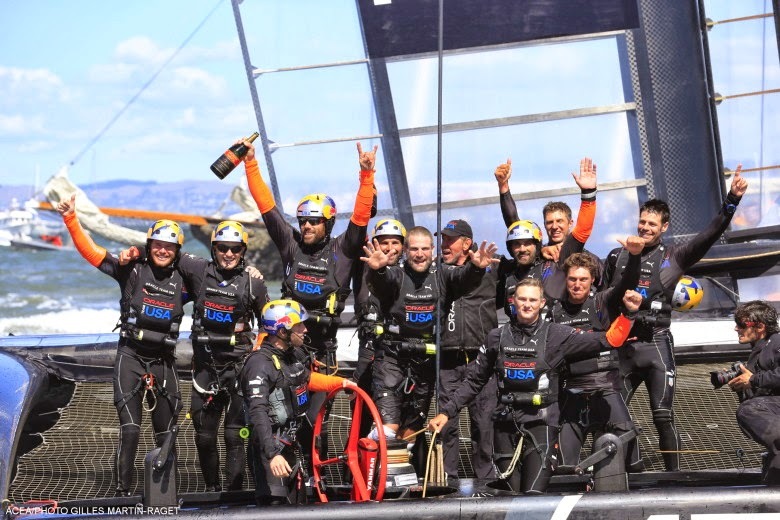 Stanley Yacht Services: CONGRATULATIONS Oracle Team USA! If you missed the last (almost) 3 weeks of amazing sailing, and we hope you didn't, let us be the first to tell you, you missed one of, if not THE most, EPIC COMEBACKS IN SPORTS HISTORY! From seemingly insurmountable odds, Oracle Team USA recovered from a 2-point deficit (due to previously assessed penalties) and a scorching 1-8 loss ratio, to win EIGHT STRAIGHT races, retaining the America's Cup in what can only be called one of the greatest displays of athletic resilience, persistence, competence and courage. At one point, it seemed the feisty Emirates Team New Zealand, helmed by Skipper Dean Barker and needing only one more victory, would easily snag the trophy but "Mother Nature" apparently had other plans and the wind fell flat on what should have been their match winning effort, forcing the race to be abandoned even as TeamNZ rounded the final marker. Oracle was handed a chance for a miracle. And the so-called "Bat Mobile" delivered. With some minor changes on board (crew and equipment), Team USA improved its performance every race. The tacking got smoother, the jibes were better timed and more efficiently designed. Simply put, Oracle took the course and conditions over. And they won. Boy, did they win! 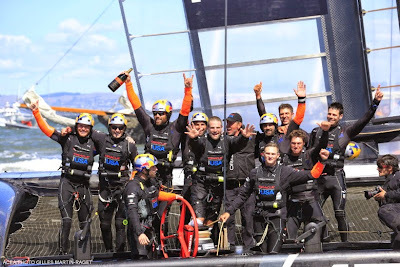 We extend our heartfelt kudos and bow our heads in respect to Skipper James Spithill and his amazing crew. It was an honor to have watched the 34th America's Cup!